Most golf properties offer communal areas that increase the leisure options of the region they are located in. Gardens, parks, sports areas, children's playgrounds and swimming pools. These facilities together with a wide range of size from small golf apartments to independent golf villas spoils you for choice when looking to buy a golf property in Spain. 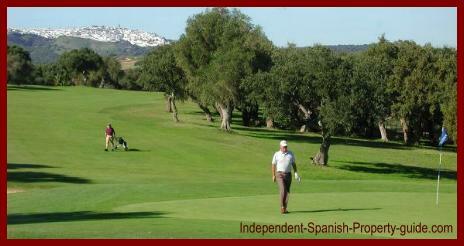 There are nearly sixty golf courses in Andalusia, the majority being between Malaga and Algeciras on the Costa del Sol. Andalusia boasts one of the warmest climates and longest sunshine hours in Europe with over 320 days of sunshine a year, allowing golf to be popular all year round. Andalusia's coastline also has the first desert golf course on the coast of Almería. When the Costa del Sol experienced a renaissance as a winter golf resort in the late eighties, the phrase "Costa del Golf" was born. Between 1985 and 1991, no fewer than 17 new golf courses appeared, bringing the total along this 50 mile stretch of coast up to thirty. When Valderrama was chosen to host the Ryder Cup in 1997, the Costa del Golf received universal recognition as the finest winter golf resort in Europe. Advance reservations for the millennium led to a flurry of new golf courses being constructed. Many of the players that have made a memorable contribution to the Ryder Cup are resident professionals in the area and are available to give lessons. Some of the clubs have excellent golf academies, like the well-known Academy of David Leadbetter which is run by professional players. There are many discounted golf shops in the area, making the purchase of golfing equipment far cheaper than in many other countries. The 'Costa del Golf' is proving to be irresistible. Golf course owners are re-investing in their courses to improve their quality still further and there are no longer any weak links, each course offering its own kind of challenge on perfect fairways and greens. The general infrastructure from Malaga to Gibraltar has improved beyond recognition. Click here for more information on the main golf courses in each area. 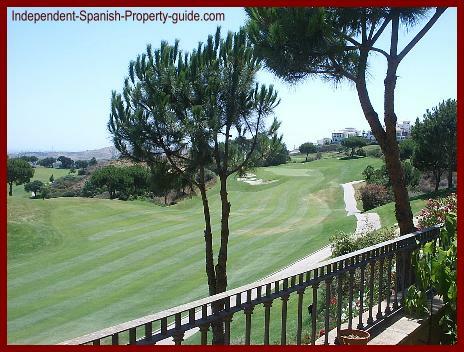 Before buying a golf property in Spain, check out the Costa del sol. The Costa del Sol has over thirty golf courses so has also become known as the 'Costa del Golf' in recent years, due to the number of golf courses in the area situated between Málaga and Algeciras. Designers include such names as Gary Player, Seve Ballesteros, Folco Nardi, Jorge Rein, Luis Lopez Martines and Trent Jones. In 1997 Valderrama was host to the Ryder Cup. Golf enthusiasts will find a variety of courses in the area ranging from technical and demanding, some with challenging lakes and bunkers and others quite straightforward with wide easy fairways. Your nearest airports are Málaga and Gibraltar. Before buying a golf property in Spain, check out the 'Tropical coast'. Costa Tropical is the coastal region of the province of Granada. It is the home of flamenco and is world famous for the beautiful Alhambra, the summer palace of the last Moorish Sultan in Spain. Costa Tropical is a relatively small stretch of coast and although there are not many golf courses in Costa Tropical, the surrounding areas provide a huge selection whilst only being a short drive away. Designers of golf courses include such names as Jose Maria Canizares, R. Espinosa, E. Mena, Ibergolf and Manual Pinero. Your nearest airports are Málaga and Granada. Before buying a golf property in Spain, check out the coast of Almería. Costa Almería is situated in the south eastern corner of Spain - east of Malaga, the Costa del Sol and the Costa Tropical. The Tabernas desert is situated on the coast of Almería and boasts the first desert golf course in Europe. It has been built to the same specifications and standards of the desert courses of Arizona and California and provides a totally different aspect to golf than any other course in this part of Spain. Famous designers of golf courses in this area include Rob Kirby, Gary Player, Jose Canales, Francisco Mendoza and Peter McEvoy. Nearest airports are Almería and Alicante. Before buying a golf property in Spain, check out the 'Costa Calida'. The Costa Calida is situated in the south east of the Iberian peninsula. To the north lies the 'Costa Blanca' and to the south lies 'Costa Almería'. La Manga is the most important tourist centre in the region and stretches between the Mar Menor (largest salt water lake in Europe) and the Mediterranean. It is an area the size of Monaco and features three golf courses. It is also home to Europe's finest tennis centre and many other excellent sporting and recreational facilities. Designers of golf courses include such names as Dave Thomas, Arnold Palmer, Robert Dean Putman and José Gancedo. Nearest airports are Murcia and Alicante. Before buying a golf property in Spain, check out the 'White Coast'. The Costa Blanca or 'White Coast' as it is known, stretches for 170 miles along Spain 's mediterranean east coast and is centred on Alicante . It runs from Valencia in the north to La Manga in the south. A proliferation of new course developments means that almost wherever you go on the Costa Blanca you are bound to come across a top-class golf course. Designers of golf courses include such names as Seve Ballesteros, Ramon Espinosa, Angel Perez de Leza, Robert Trent Jones Jr. and Javier Arana. Before buying a golf property in Spain, check out the 'coast of light'. The Costa de la Luz (coast of light) is the western part of the Andalusian coastline that faces out to the Atlantic. The sand is finer and of a more golden colour than the neighbouring Costa del Sol. The typical beaches here are more expansive and probably backed by sand dunes and pine trees. This part of the coast has not seen the high rise hotel development that other parts of Spain have experienced. It was in this province that the first game of golf was played in Spain, by British mining engineers at the 'Rio Tinto' mines. The makeshift course they built was moved several times until it was sited on what is now the nine-hole 'Corta Atalaya' layout. Famous Designers include Seve Ballesteros, Jack Nicklaus, Manuel Pinero, Alvaro Arana, Stirling and Martin. Nearest airports are Jerez and Sevilla. 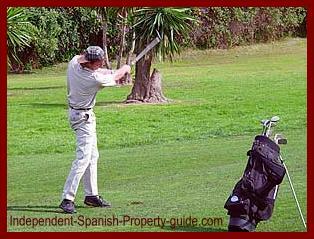 Golf property in Spain and investment opportunities. Due to the huge number of golf courses along the Spanish coasts, golf property in Spain or property near to golf courses is very popular. These properties are ideal for golfers for obvious reasons but also for 'buy to let' investors. The Spanish coasts are thriving during the summer months with tourists, making it easy for property owners and investors alike to generate a rental income well above mortgage repayments. With golf property there is also a very busy 'low season' with hordes of golf enthusiasts flocking to Spain to enjoy golf holidays in very calid climates. To the investor this offers almost a constant flow of rental clients making golf investment property the favourite for 'buy to let' investors. What is more, golf property in Spain and golf club developments these days have features that appeal to non-golfers. They have always had the attraction of all that green space that is guaranteed not to get built on, and a clubhouse to provide a ready-made community focus, but now the better ones also offer gyms, spas, pools, tennis courts and other leisure facilities. Before you invest in golf property, you should take lots of golf holidays first to check out the area and the golf course. If you are interested in purchasing a golf property in Spain, fill out this form, and we will be in touch.